Archaeologists in southern England have found what may be one of the largest medieval royal palaces ever found – buried under the ground inside a vast prehistoric fortress. The probable 12th-century castle was discovered by archaeologists, using geophysical ground-penetrating ‘x-ray’ technology to map a long-vanished medieval city which has lain under grass on the site for more than 700 years. Situated inside the massive earthwork defences of an Iron Age hill fort at Old Sarum in Wiltshire, the medieval city was largely founded by William the Conqueror who made it the venue for one of Norman England’s most important political events – a gathering of the country’s nobility at which all England’s mainly Norman nobles and lords swore loyalty to William. An aerial photograph of the site. The newly discovered probable royal palace is under the grass in the quadrant opposite the foundations of the cathedral. The enormous earthworks surrounding the site are from the Iron Age.The earthwork in the center is the medieval castle mound. 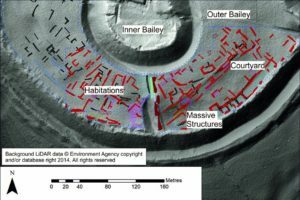 The Old Sarum geophysical survey is being carried out by archaeologists from the University of Southampton – and is giving researchers an unprecedented and unique opportunity to more fully understand Norman town planning. So far they have been able to uncover the buried foundations of literally dozens of ordinary houses – and a vast mystery complex that is likely to have been a huge royal palace. The 170 meters in length, 65-meter wide complex, arranged around a large courtyard, had walls up to 3 meters thick – and included a 60 meter long probable great hall, what appears to have been a substantial tower and multi story buildings with upper floors almost certainly supported by substantial columns. “The location, design, and size of the courtyarded complex firmly suggest that it was a palace, probably a royal one. The prime candidate for constructing it is perhaps Henry I sometime in the early 12th century,” said one of Britain’s leading specialists on high-status medieval buildings, Dr. Edward Impey, Director General of the Royal Armouries. It is the first time that archaeologists in Britain have ever discovered what is probably a previously unknown medieval royal palace of that size. Up until now, historians have thought that the only royal residence at the site was a much smaller complex on top of a man made castle mound. “This is a discovery of immense importance. It uncovers the monumental scale of building work taking place in the earlier 12th century,” said historian, Professor David Bates of the University of East Anglia, a leading authority on Norman England and author of the key modern study of the Norman world – The Normans and Empire. Because the city was largely abandoned up to 140 years after most of part had been built, and because it has remained a green field site ever since, it is giving academics a unique opportunity to examine a Norman city. 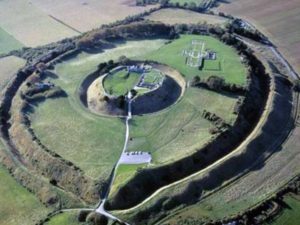 “Archaeologists and historians have known for centuries that there was a medieval city at Old Sarum, but until now there has been no appropriate plan of the site. Our survey shows where individual buildings are located – and from this, we can piece together a detailed picture of the urban plan within the city walls,” said the archaeologist leading the geophysical survey, Kristian Strutt of the University of Southampton. 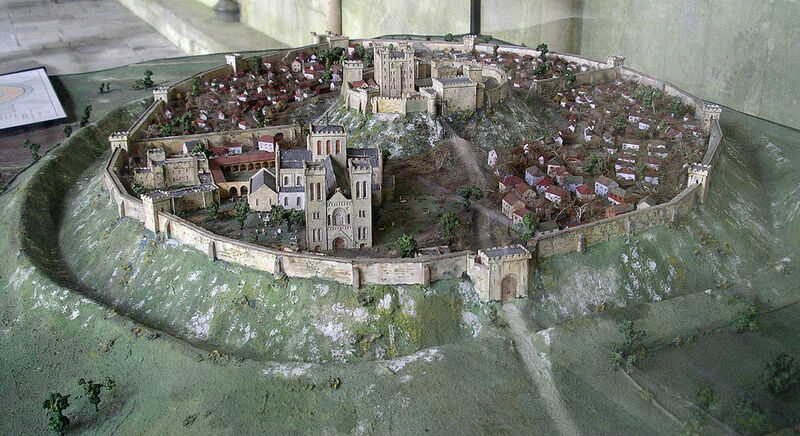 The development of the Norman city of Old Sarum – including a spectacular cathedral – was symbolic of a large scale monumental building trend which was taking place around the country in the late eleventh century. Bury St Edmunds, Norwich and Lincoln were all being hugely expanded – and cathedrals were being built in Westminster, Winchester, Gloucester and York. In London, the White Tower of the Tower of London was being built. However, by the early thirteenth century, the political and diocesan center at Old Sarum was proving too cramped and exposed to the elements – and was therefore moved, lock, stock, and barrel, to a totally new location, Salisbury, two and a half miles to the south. Even the masonry of the great Norman cathedral and other structures were transported and re used to construct a new cathedral and other buildings in the newly settled city of Salisbury. All that remained of Old Sarum, politically, was its right to send two MPs to Parliament – until, that is, the rotten boroughs were abolished with the passing of the Reform Act of 1832. Today the site, including the medieval mansion and the visible foundations of the Norman cathedral, is in the care of English Heritage. Only now is geophysical survey work beginning to re-discover the long vanished city – and what appears to have been its truly massive royal residence.